On the face of it, the religion clauses of the U.S. Constitution’s First Amendment seem pretty clear: “Congress shall make no law respecting an establishment of religion, or prohibiting the free exercise thereof.” That isn’t so hard to understand, is it? Granted, the meaning of “an establishment of religion” requires explaining, and the extent and limits of religious free exercise need to be specified. But surely these matters aren’t so terribly obscure that they require an endless stream of legal tests. Yet, as the Supreme Court’s new term gets underway, its docket includes still another big church-state case. This one concerns the practice of opening sessions of public bodies with prayer, as happens with sessions of Congress and the Supreme Court itself. Some people may find it strange that we still need to argue about this so late in the day. A bit of historical background may help. For the nation’s first century and a half, there was relatively little constitutional litigation centering on the religion clauses. People apparently agreed on what the language meant and were willing to leave it at that. Shortly after World War II, however, significant church-state disputes began in earnest. Significantly perhaps, this development coincided with the postwar growth in size and influence of the Catholic Church in the United States, which some people‚—including, as we now know, even some Supreme Court justices—found troubling. It’s hard not to see this concern to keep the Catholics in their place as one underlying explanation for the sudden rash of court tests. Part of the reason, too, was the emergence of a new, ideologically driven thrust toward the secularization of American institutions. Since the 1940s, many, though by no means all, of the controversies have been school-related–religion in public schools, state assistance to parochial schools. In a decision in 1971, the Supreme Court delivered the famous Lemon test for identifying impermissible interaction between government and religion. The result was a fresh stream of cases requiring the increasingly frustrated justices to attempt to unravel the new complexities and contradictions created by Lemon. Thus the church-state sector remains a murky battlefront in constitutional law. And now the Supreme Court is trying again. The new case (Greece v. Galloway) comes from Greece, N.Y., a town of 100,000 near Rochester, where since 1999 the town council has opened its meetings with prayer offered by a visiting clergyman. Two local women objected to this practice and went to court. A panel of the 2nd U.S. 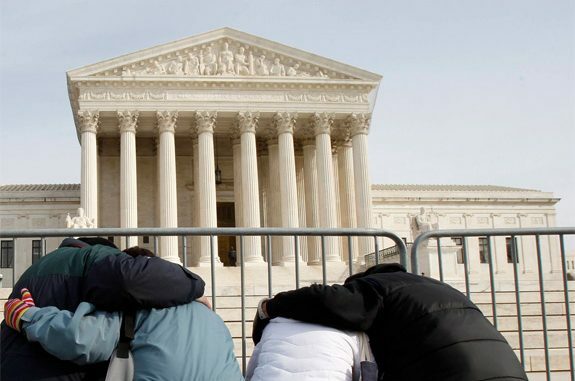 Circuit Court of Appeals agreed with them—even though the Supreme Court had said back in 1983 that there is no intrinsic constitutional violation involved in public prayer of this sort. The court will hear oral arguments November 6, with a decision expected next spring. A large number of individuals and groups with church-state interests have submitted briefs in the case. Surprising to some, the Obama administration’s Justice Department has entered the fight on the side of the town. So have nine prominent Catholic constitutional specialists, including Gerard Bradley of Notre Dame, Helen Alvare of George Mason, Robert George of Princeton, Hadley Arkes of Amherst, and Mary Ann Glendon of Harvard. Their chief concern, it seems, is that the lower court decision sought to revive the moribund Lemon test instead of allowing it rest in peace. Many people who aren’t constitutional authorities would agree that’s a bad idea. “We are a religious people, whose institutions presuppose a Supreme Being,” the Supreme Court declared years ago. Let’s leave it at that.